The Pleasant Poppy: Who me? Woke up this morning to find a lovely surprise. wonderful new friend Elaine from The Newfarmerette. I have never been given a blog award yet. So getting one from a new friend is a wonderful surprise. I also realize that newcomers to this blog will note how new it is. I hope to be here for awhile. I will also come out of my blog posting coma and continue on. I have been doing stuff to get ready for my son's 10th birthday. Busy busy! With this award comes rules. But don't worry...easy to do! 1)Thank the person who nominated you for the award and link to them. 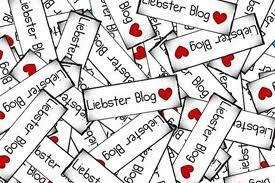 2)Copy and paste the Liebster award to your own profile. 4)Link to them and leave a comment letting them know. 2) Food in Jars - Great recipes for preserving food. 3) Vanilla Sugar Blog - Some great recipes and photos! 4) LIVE It, SURVIVE It, CONQUER It -A friend who has been through a lot. She has tremendous spirit. 5) From An Igloo - A terrifically crafty blog!